Nick Adamson and the Bully Dog team had to sweat it out to the final round of Super Diesel at the 2013 World Finals to see if they could hang onto the points lead. It all came down to one round and one racer, Ryan Dubois. If Dubois could win the World Finals he would become the 2013 MBRP Diesel Drag Racing Series Super Diesel National Champion. But Dubois was red in the final and Nick Adamson hung on that coveted points lead for the 2013 National Championship. 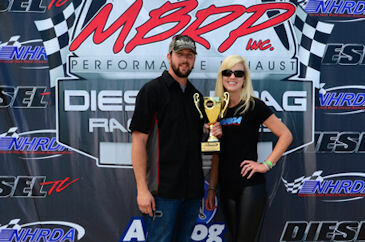 Adamson in his first full season as a driver picked up two wins along the way to claiming the MBRP Diesel Drag Racing Series National Championship.